This is one of my favorite sandwiches. 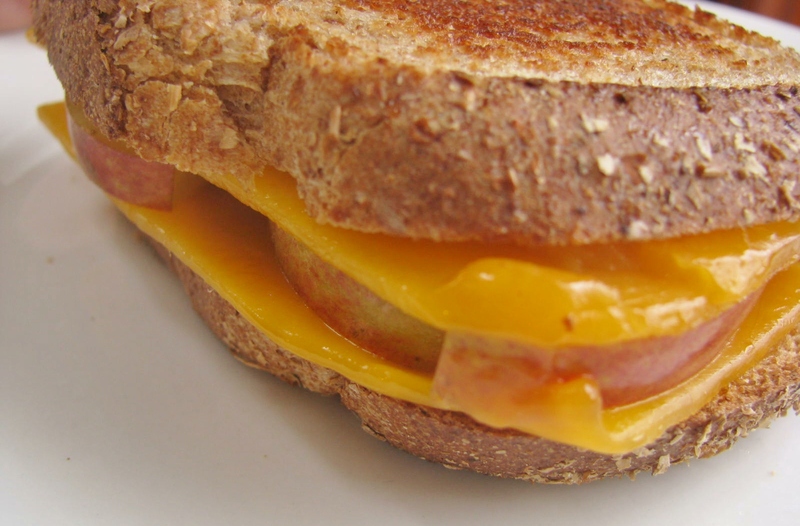 It’s a grilled cheese on some good, whole grain bread, with thin slices of apple between the cheese. Basic and delicious. And if you eat the remaining apple slices – there’s your serving of fruit for the day. The Kiku apple is new where I shop. We get things here in the woods a few years after they arrive in the city. It looks like a Fuji, and it tastes sweet, crunchy, and mildly juicy, with a hint of tartness that you won’t find in the Fuji or Gala apples. Prior to using the Kiku, I used Gala or Fuji for this sandwich. Use whichever apple you prefer however I would not recommend a McIntosh or a Red Delicious for this recipe. Too mealy. While I was slicing the apple, someone called me to come upstairs for something. Thirty minutes later, I had done whatever I was called upstairs to do, plus I finished some laundry and emptied the upstairs wastebaskets. When I came back downstairs, the apples were starting to turn a little brown. Fortunately, I had not put the sandwich in the pan prior to heading upstairs. So although they appear brownish, the apple slices were really good and crispy. Sorry for the bad photo of the brownish apple slices. I usually put my apple slices on AFTER grilling because I like them to be cold on the warm sandwich. Adds to the texture – the warm, gooey, melted cheese with the fresh, cool, crispy apple. Butter one slice of bread and place butter-side down in frying pan. (You may use olive oil in the pan in place of the butter.) 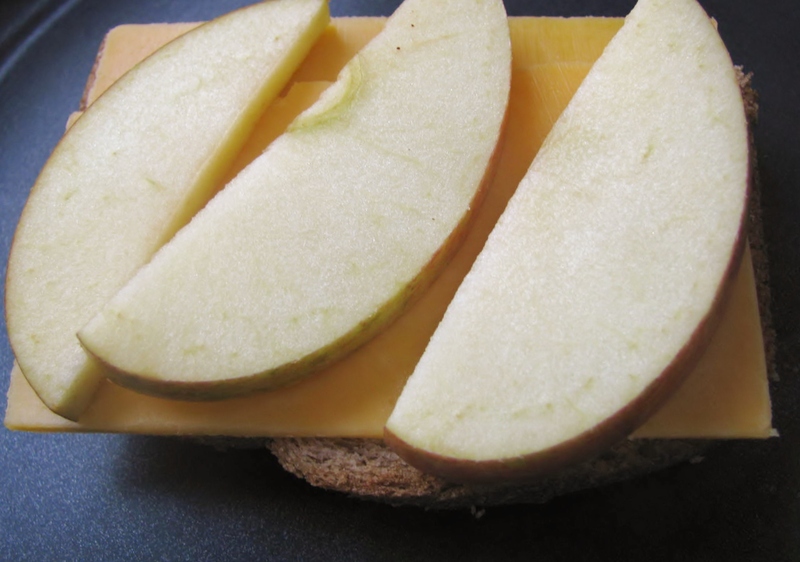 Add a slice of cheddar, very thin apple slices, and more cheddar. Continue to add layers until it is as thick as you like. Top with another slice of buttered bread. Grill on both sides until cheese is melted. Enjoy. I’ve never heard of a Kiku apple, but this sandwich does look mouth-watering! Thanks for stopping by. 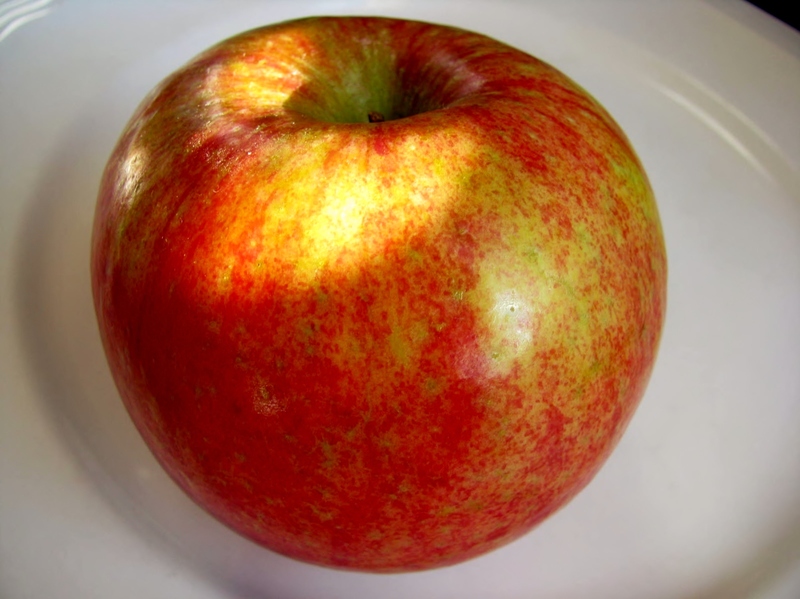 Any crisp apple – Fuji, Gala, etc. will do or any apple that you like. I just don’t like the mushy ones (McIntosh) in my sandwich. I have not heard of this, but it looks delicious! I may have to give it a try!! Thanks so much for stopping by and for the suggestion! !